A Passion for the Sea. Reflections on Three Circumnavigations. Hard Cover, with color photos. 487 Pages, published by Cornell Publishing. 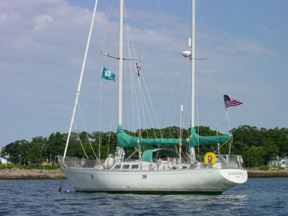 In 2006, Jimmy Cornell completed his third circumnavigation on his third boat, Aventura Trois. The legendary Cornell, who wrote the classic World Cruising Routes, started the Atlantic Rally for Cruisers (ARC), and created the world cruiser’s online resource Noonsite, shares with us an exceptionally interesting look at his adventures. Despite its title, A Passion for the Sea, it is really a book about getting to and being at the destinations rather than out on the seas as the title suggests. Alternating with tales of the places he’s visited are stories of the things he’s learned and tips about what to be prepared for. This is not the kind of book that you want to necessarily read cover to cover in one sitting. It is rather a book that you can scan and read a section at a time with no loss of interest or continuity. Its organization is quite interesting in that topics like anchoring are discussed in the context of stories. Those stories can take you from Cuba to Antarctica in the span of a couple of pages. So the continuity is in the experience rather than the route or the topic. It’s not a “how to do” and it’s not a “where to go”. It’s a “what you’re going to deal with that becomes a memorable lesson on land and sea wherever it happens”, which is pretty much what cruising is all about. It’s also interesting to learn about Jimmy’s life and decisions along the way, including the decisions that prompted three versions of Aventura in which he lived his adventures. 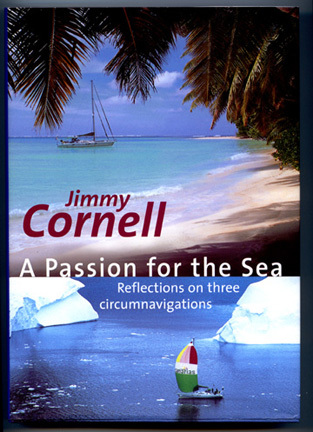 Unlike Jimmy’s other books, A Passion for the Sea is not easy to obtain. It’s not available on amazon.com or in bookstores here. We bought it directly from Jimmy at one of the boat shows and got to talk to him and have it signed as a side benefit. He is a very entertaining speaker so it’s well worth tracking him down on the speaking circuit. Pick a non-prime time lecture and you may manage to ask your most pressing questions of one of the undisputed masters.